Having tired of potential readers saying, “But, I only have a Nook, “ I decided to venture forth into the surprisingly friendly world of other eReader applications–as downloaded onto on my iPad Mini (iOS 6). My entry into the world was through the back door. Smashwords is an eBook converter-retailer-distributer. After the carefully formatted (which took me two days!–I have a learning curve.) word document is uploaded, Smashwords’ Meatgrinder Conversion System software spits out formats for Online Reading (HTML), “.mobi for Kindle and Kindle apps, Epub for Apple iPad/iBooks, Nook, Sony Reader, Kobo, and , most e-reading apps including Stanza”–which is where I’ll stop–PDF, LRF (old Sony Readers), Palm Doc, and Plain Text. The 103 page PDF Style Guide specifies that the formatting needs to be verified. I didn’t download the Adobe ePub viewer software on my MAC because I choose to not override the security block for App-Store downloads. TMI. So I downloaded additional eReaders. Going through the Style Guide explained several things I’ve noticed in eBooks over my years of reading them. For example, I’m accustomed to new chapters starting on a new page. I’ve been surprised a couple of time by iBooks titles that have a blank page after each chapter. Now I know why. The style guide recommends–in big print–taking out all page and section breaks to eliminate inadvertent blank pages and using a three return chapter break instead. There are no new-page chapter starts, also no funny blank pages. Just a side note. 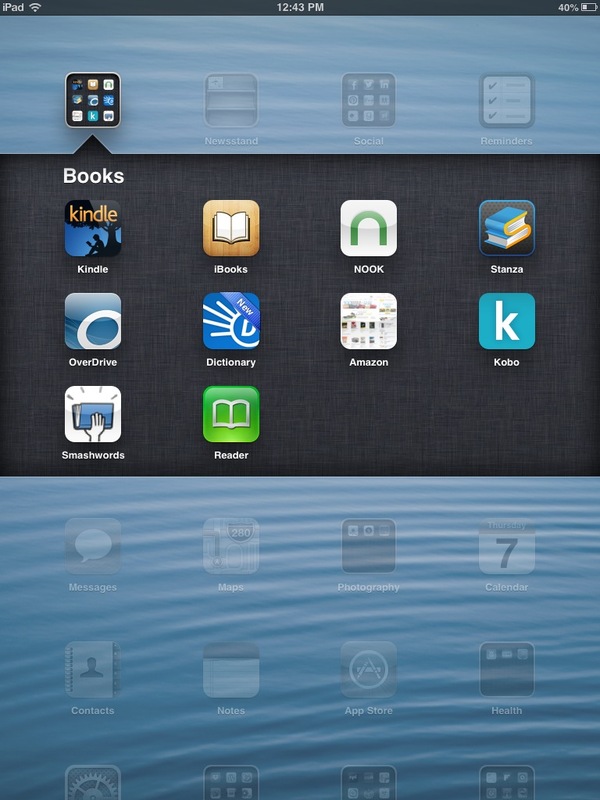 Way back when, I blogged about eReader features on one of the old iOS operating systems. My brief review tells me that the playing field is more level now, except of course for Kindle, which looks to me like the only way to access the grandmama of all eBook stores, Amazon. I got 61 hits at the App Store for eReaders, 47 for eBook readers, and 47 for Kindle. Lots of choices. These were mine. I downloaded my newly formatted Illegally Dead in the following formats and scoped them out. All readers turn pages with a tap or a swipe, and all offer a suitable reading experience, but some are more functional than others. In all cases, font selection and lighting work. The uploaded source document (.doc works, .docx doesn’t work) is single spaced with paragraph indents, functional external and internal links, consistent centering, no page breaks, and no font variations beyond size, bold, and italics. Kindle: (My original Kindle Edition stays active and for sale.) Comparing the Smashwords’ Edition to my Kindle Edition as formatted by Amazon; the Amazon one accommodates paper book style layouts with chapters starting with new pages, and all the expected page breaks and style variations remain intact. In the Smashwords for Kindle version, there are three blank lines between sections allowing for free-flowing text. The paragraph formatting is intact. All my hyperlinks work. External links open webpages and allow a seamless return to reading, and internal links connect to appropriate targets. Some of the centering is gone. Nook: Again, the eBook opens to the cover. The paragraph structure has been converted to double-spaced with a space between paragraphs, though the indents held. The centering, for the most part, is gone. Internal links are functional for the TOC, but external links do not work. I compared it to my original upload of Illegally Dead-Nook Edition, and find it to be essentially the same. I also opened a publisher’s ebook and found it to have similar issues. Interesting to note is that the Smashwords’ version is not in the Nook library as a book but appears under All Items and My Files. Stanza: The Stanza version was more difficult to download, but I was successful when I signed into Smashwords through the Stanza application. Then the download was smooth and efficient. None of the links work. The TOC is non-functional. The centering of text is gone, and the paragraphs have been converted to block style with an extra line between. It looks like about 1.5 spaces, or perhaps a generous single space. Overdrive: This is most commonly a library application, I believe, but the download was successful onto the iPad. It opens to the cover. The centering is intact. Text is double spaced, and paragraphs are indented. TOC links do not work, however the return to TOC links in the chapter titles work just fine. Go figure. External links are functional but kick the reader out of the application. Kobo: The download was clean, and I did not have to create a kobo account. An interesting feature of Kobo is that the reader can select Kobo Styling, which is double spaced, or not, which returned the text to the original single space layout. There are also options about page turning style, which are functional. External links open within the application and give the option to open in Safari. Centering and layout are intact. Internal links are functional, as is the table of contents. Sony: The download was clean and fast. The centering, formatting, line spacing, and indents are all intact. The single-spaced TOC is hard to use, but the Contents within the app work well. External and internal links are functional. The external links open within the app, making the return to the reader seamless. None of the readers automatically synced my iPad downloads to my iPhone. Obviously, that would have to be done manually, which isn’t a problem with Smashwords since once purchased the buyer has unlimited downloads in all formats. I haven’t checked, but I suspect the last page read syncs won’t work either. I’d love to hear your additions or corrections to the above. Post to comments. wow. that was very helpful … I’m gathering “how to” info now and hope to put something on amazon etc. soon. I opted out of distribution to Amazon. The title I posted to Amazon myself are very clean and I have it down fairly pat. I started formatting epub and mobi files last August, and throughout the fall, I invested in a number of different e-reader devices. Like you, I find it fascinating to see how the same input will render differently across different devices. I currently own an iPad, iPhone, Nook Color, Nook eInk, Kobi Mini, Kindle Fire and a very basic Kindle. Plus I use Kindle for Mac software and Adobe Digital Editions. Smashwords now allows authors to upload their Word .doc to the meatgrinder, then after the book is live, you can replace the epub they make with a custom epub you’ve made. This sometimes gives a better product. If providing your own epub file, it must say Smashwords Edition on the copyright page. Apple has just implemented some upgrades on their site and added distribution to Japan. They have a host of specific formatting guidelines that go beyond the standard “valid epub” that most retailers require and that most formatters provide. When working through an aggregator such as Smashwords, this can be frustrating. Your book may go live on other premium distribution channels, such as Sony, Kobo or B&N, but fail at Apple. Apple will send a “ticket” to Smashwords, but there may be a delay in Smashwords conveying the cause of the specific formatting problem to you. Then you have to figure out how to fix the Apple version without disrupting the distribution to the other retailers. I know many people use and love Calibre, but be aware that the software developers themselves don’t recommend its use for commercial products. Explanation from Calibre re: doesn’t always produce valid epub files. Not meant for epub producers, meant for users to convert their documents so they can use them on different devices. I’m battling through a learning curve with Kindle right now. Turns out there are actually two slightly different languages used for interpreting files on the different Kindles. Old style and basic model Kindles still read mobi, while Kindle Fires and PaperWhites read KF8 language. Supposedly, when you upload a book to Amazon, it renders it accurately into both languages automatically, but I’ve experienced some quirks with the KF8 language. Click the cover for information on my latest novel.